The idea of giving one's testimony often evokes summer church camps, evangelistic revivals, mission trips and baptisms. Like an eyewitness called to testify in a courtroom, sharing a testimony of faith is for specific people at special moments. But what if our view of testimony is all wrong? According to Amanda Drury, testimony is not merely about describing something that happened in the past. It is a practice that forms our present and future identity. Testimony changes us, and without it we risk having a stunted and stale faith. Drawing on work in sociology, psychology and theology, Drury develops an understanding of testimony as an essential practice for Christian spiritual formation, especially for adolescents who are in the process of developing their identity. Recent studies reveal a staggering inability for adolescents to articulate their religious beliefs. Now more than ever, churches need to recover the practice of testimony as an integral part of communal worship. Amanda Drury (PhD, Princeton Theological Seminary) has been in youth ministry for almost fifteen years. She now serves as assistant professor of practical theology at Indiana Wesleyan University and is ordained in the Wesleyan Church. She teaches, speaks and writes on youth ministry and her passion is to see teenagers empowered to express their faith in words and actions. Amanda has three children with her husband John and they reside in Marion, Indiana. 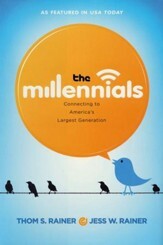 Thoughtful, practical and creative, Drury's book opens up new perspectives on ministry with young people. One of the most original and helpful contributions to practical theology in recent years. I love it when I discover an area in my youth ministry practice or thinking where I was wrong. This is God's ongoing revelation to me, peeling back misconceptions and malpractices, causing growth in my life and practice of youth ministry. 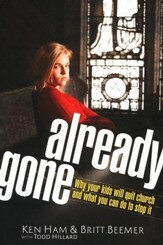 Amanda Drury's book winsomely confronted me and conclusively helped me rediscover a critically important aspect of adolescent spiritual formation that I - along with thousands of my youth ministry peers - had gradually relegated to the youth ministry storage closet in the basement of the church. Time for a course correction; time for growth; time for testimony. When it comes to helping young people develop their own spiritual identities, few things are as important as helping them discover an authentic vocabulary for their faith. With our focus on missions and programs, helping youth articulate their faith often gets lost in the shuffle. But Amanda Drury teaches us how - and brilliantly. It won't take more than a few chapters to reveal that Mandy is one of the most profound, accessible, original voices ever to speak into the conversation about youth ministry. Amanda Drury is one of the most creative and thoughtful people thinking about youth ministry in North America. Mandy has the rare talent to seamlessly blend deep theological ideas with TV shows, parenting and her own experiences in youth ministry. She writes and speaks effortlessly, with numerous creative turns along the way. As Mandy presents in this book, testimony has become a lost element in the church, and its loss has been at the detriment of our youth, as they've been neglected the nourishment that is dependent on testimony for active Christian living. The stories of God's action in each of our lives are the meal that gives our young people the strength and vision to seek God. Saying Is Believing addresses the famine of testimony we face, and promises a feast for the reader and the ministry he or she is called to lead. 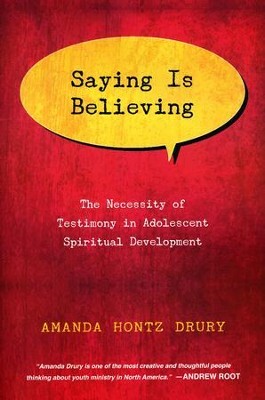 Saying Is Believing establishes Amanda Drury as a new and compelling voice in practical theology, a pacesetter for a generation of scholars convinced that the way we form young people's faith profoundly affects our own. 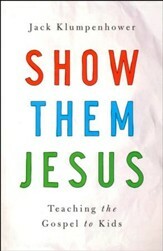 Drury quickly nuances and moves beyond the commonly cited research on teenagers' religious inarticulacy; a natural storyteller, she makes theologically rich analysis easy to digest, and serves it alongside generous portions of practical wisdom for helping young people learn to speak their convictions. Saying Is Believing is less about problems than solutions, which makes it a must-have resource for anyone who takes young people's faith seriously. Amanda Drury has done youth ministry - and the church as a whole - a great service by recovering the lost practice of testimony. If we truly desire to see youth develop a winsome, robust and enduring faith identity, we cannot afford to neglect her call. Both thought-provoking and inspiring, Drury's Saying Is Believing represents practical theology at its best. "Drury's work draws on her doctoral research . . . resulting in a publication which is both robustly theological and innately practical; happily satisfying for the reviewer, who is both a theological student and a youth leader!" 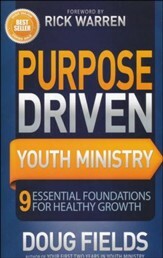 "Not only is this a thought-provoking book for youth ministers, it will also challenge the thinking of Christian parents, and perhaps most importantly encourage senior pastors who are striving to integrate teenagers in to the whole life of the church community." "Very few authors have the ability to balance ideas and practice with hearty substance in both areas, and this is why I recommend this for any individual working in ministry to the next generation. Mission teams, college students and senior pastors will find it challenging and enlightening. One of my favorite aspects about this work is that it is adaptable to almost any ministry setting: inner-city, parachurch, camp, pre-teens to young adults, mission field, and everything in between. Saying is Believing is pure brilliance and something from which youth ministry will benefit forever." "Drury draws on her experience in youth ministry and her holiness heritage (where a mic in the aisle meant we'd hear from more than just the pastor). As you would expect, she has anecdotes about the telling our particular faith story, but at its core this is a book that is well-researched, sophisticated and theologically thoughtful. Drury doesn't simply make claims of the necessity for testimony but engages serious research. Her chapter on a 'Theology of Testimony' synthesizes the perspectives on witness in Phoebe Palmer (the Nineteenth century, Holiness evangelist) and Karl Barth. This is a creative and thoughtful treatment on testimony." "Amanda Drury has done youth ministryand the church as a wholea great service by recovering the lost practice of testimony. If we truly desire to see youth develop a winsome, robust and enduring faith identity, we cannot afford to neglect her call. Both thought-provoking and inspiring, Drury's Saying Is Believing represents practical theology at its best." I'm the author/artist and I want to review Saying Is Believing: The Necessity of Testimony in Adolescent Spiritual Development.